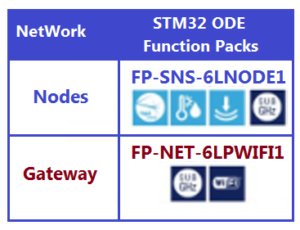 Pre-built software function pack (FP-SNS-6LNODE1) that provides a sample application that allows full access to the sensors and actuator resources on the IoT node by means of the OMA Lightweight M2M (LWM2M) standard protocol, using the IPSO Smart Objects Guidelines for data representation. Pre-built software function pack (FP-NET-6LPWIFI1) providing an application-level functions implementation to bridge 6LoWPAN IoT nodes with a WiFi network (UDP protocol support only). A sample application is provided to access the resources (e.g. 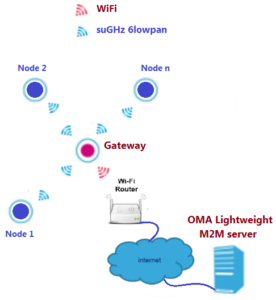 sensors or actuators) on the 6LoWPAN nodes by means of the OMA Lightweight M2M (LWM2M) protocol. For get the OMA specification go here. Below there are a graphical network explanation. STM32 Nucleo-64 development board (NUCLEO-F401RE) powered by a high-performance STM32F4 MCU, with support for Arduino and ST morpho connectivity. Includes an integrated ST-LINK/V2-1 debugger and programmer. STM32 Nucleo motion MEMS and environmental sensor expansion board (X-NUCLEO-IKS01A2) featuring an accelerometer, gyroscope and compass MEMS as well as pressure, temperature and humidity sensors. STM32 Nucleo proximity, gesture and ambient light sensor expansion board (X-NUCLEO-6180XA1) designed around the VL6180X proximity, gesture and ALS sensor, based on ST’s FlightSense™ Time-of-Flight technology. Sub-1 GHz module expansion board X-NUCLEO-IDS01A4 (868 MHz) or X-NUCLEO-IDS01A5 (915 MHz) based on the fully certified SPIRIT1-RF module SPSGRF-868 or SPSGRF-915. STM32 Nucleo Wi-Fi expansion board (X-NUCLEO-IDW01M1) designed around the fully certified SPWF01SA serial-to-Wi-Fi module.